Penerbitan Fakultas Biologi Universitas Jenderal Soedirman saat ini menerbitkan dua berkala ilmiah online di bawah ini. Publikasi dalam bentuk prosiding seminar dan simposium yang diselenggarakan oleh Fakultas Biologi Universitas Jenderal Soedirman dapat diakses di tautan berikut [ Pertemuan Ilmiah ]. 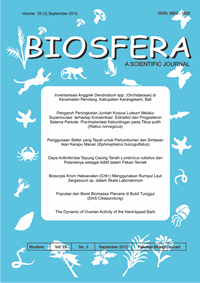 Scripta Biologica is a peer reviewed open access electronic journal published by the Faculty of Biology Jenderal Soedirman University, publishes research papers encompasses all aspects of biology, including; molecular biology, cell biology, and genetics; physiology and reproduction; ecology and conservation; biodiversity, evolution, taxonomy, and biogeography. 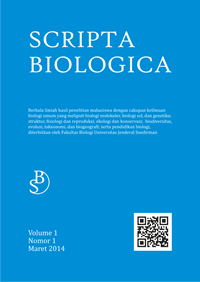 Scripta Biologica publishes research papers encompasses all aspects of biology including molecular biology, cell biology, and genetics; physiology and reproduction; ecology and conservation; biodiversity, evolution, taxonomy, and biogeography. Already have a Username/Password for Scripta Biologica? Go to Login. Need a Username/Password? Go to Registration. Scripta Biologica accepts original scientific research papers written in Indonesian or English. The submission and publishing processes are free of charge. The document should be prepared using a Guide Template and saved in Microsoft Office Words format (.doc, .docx) on A4 paper size with 10 points body text of Cambria typeface, 2,5 cm for top margin and 2 cm for left, right, and bottom margin. The length of the document is unlimited, but editor recommends no more than ten pages of text, excluding tables, figures, and attachments that should be inserted at the end of the manuscript. Tables should be attached or inserted in a standard table of Microsoft Word or Excel. All figures should be provided in JPG, JPEG, or PNG formats with a 300 dpi resolution, the dimensions (width and height) of at least 800 px, and the aspect-ratio remain unchanged. Title of the manuscript should be written in brief, clear, and content informative sentence, no more than 20 words. First and last name of the author(s) should be written completely. Institution name and address should also be written explicitly. Author for correspondence along with email address is required. Abstract should be written concisely containing the research objectives, primary research results and, if any, the conclusions and their implications. Below the abstract five keywords should be provided indicating objects, locations, unique methods used. Introduction should be composed of adequate backgrounds and the importance of research, it may also include a brief review of past research directly related to the findings. Methods should be emphasized on the procedures and data analysis. Only specific equipment should be presented while the standard equipment should not. The research procedure should be described in a coherent and precise manner. The design approach and method of analysis should be explained. Results and Discussion should be written containing research results that clearly presented and described. The discussion should be written thoroughly represents the causal effect of the research results mainly explains why and how the results of the research came up, it may also explain the advantages and disadvantages, the constraints that appear in the study and so forth and possible solutions. Conclusion should be written concisely to conclude the results of research without further explanation. Acknowledgments if necessary can be written at the end of the manuscript before the References, all sources of institutional, private, and corporate financial support for the work must be fully acknowledged, and any potential conflicts of interest should be stated. References should be composed containing only references referred to in the manuscript in alphabetic order according to the bibliographic format of the CSE (Council of Science Editors) Name-Year sub-style. The submission file is in Microsoft Word (.doc, .docx) document file format. The manuscript should be prepared using a Guide Template available for download at the following link [ Guide Template ]. The length of the document is unlimited, but editor recommends no more than ten pages of text, excluding tables, figures, and attachments that should be inserted at the end of the manuscript. Tables should be attached or inserted in a standard table of Microsoft Word or Excel. All figures should be provided in jpg, jpeg, or png formats with a 300 dpi resolution, the dimensions (width and height) of at least 800 px, and the aspect-ratio remain unchanged. The text adheres to the stylistic and CSE (Council of Science Editors) bibliographic Name-Year format outlined in the [ Author Guidelines ]. Majalah Ilmiah Biologi Biosfera : A Scientific Journal is a media that published by Faculty of Biologi, Jenderal Soedirman University. The Journal accomodates peer reviewed articles which is a results of research in tropical biology which includes cell biology, genetics, evolution, taxonomy, biodiversity, structure and function, developmental and reproductive biology, entomology, microbiology, and ecology. Published three times a year (January, May, September). Taxobio is an open access, online-only, peer-reviewed journal, publishes scientific papers in taxonomy, nomenclatural review, classification of taxa, introduction of new methods for data development and analysis, gene ecology, population genetics, genetic diversity, biodiversity and phylogenetic studies.